A fun, lively academic competetion for high school calculus math students. Have you seen Jeopardy on TV? The same idea - but just for high school math students. Calculus bowl games are currently being held in Laramie, Wyoming, Arlington, Texas (11th annual), Kingston, Rhode Island (5th annual), and now Aurora, Colorado. Mu Alpha Theta, the National High School and Two-Year College Mathematics Honor Society, also hosts Calc Bowl games. Thousands of students have participated in these events. Students have about one minute to answer questions from pre-calculus and calculus, design to test students' mathematical knowledge and skill. The first team to buzz in gets a chance to answer the question. High score wins the round. Preliminary rounds lead to the final playoff event and highlight of the event. Familes and friends are all encouraged to come and show your support for your favorite team! Calc Bowl Sponsors:Thanks to Northrop Grumman (Aurora), the American Society of Civil Engineers, Aurora Public Schools, and charitable minded individuals for supporting Calc Bowl 2017! Some History of the Rocky Mountain Area Calc Bowl Originally created in 1992 for calculus students at the University of Wyoming in Laramie, Wyoming - subsequently, community college and high school students were invited to participate. It turned out that the Calc Bowl was more popular with high school and community college students than with University students. Calc Bowl has been very popular in the Denver metro area, with over 50 teams participating every year since 2010. Former UW students have since taken the idea to the University of Rhode Island, Kingston, and University of Texas, Arlington. 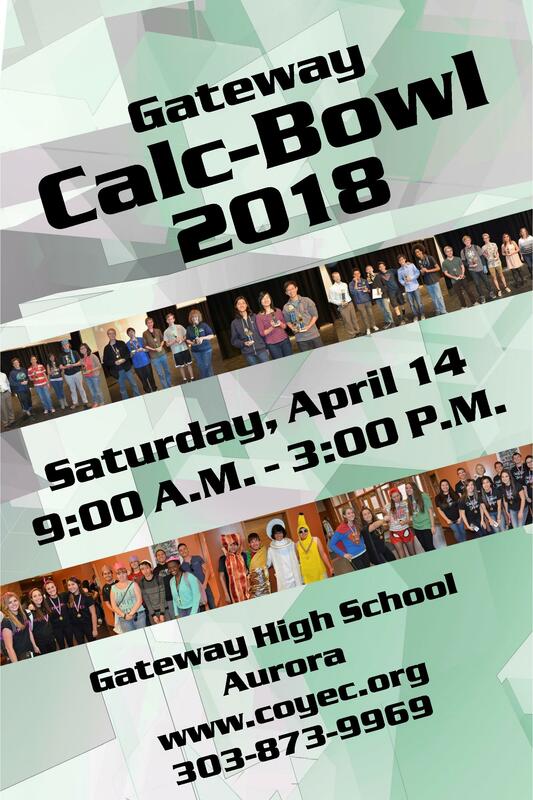 Calc Bowl has been an annual event for high school students in the Denver metro area since 2008.